Rosemary enlisted the support of 120 of her professional colleagues who took part in a simultaneous 'busk' in March 1992 at sixteen British Rail stations. In two hours they raised £6000 for the benefit of the young township musicians. Since then several hundred distinguished musicians have participated in a further four 'busks'. Funding now comes from South African corporate sponsorship, various South African and UK Trusts, individual donations, CD/DVD sales and performances by the Buskaid musicians. 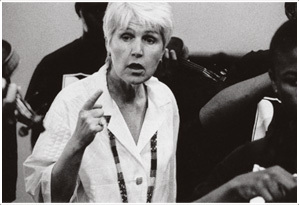 The Buskaid Soweto String Project was established by Rosemary Nalden in January 1997 in response to requests from the local Diepkloof community. Initially the fledgling project consisted of fifteen members of the original Diepkloof Project and a few new beginners. Since then it has grown exponentially, and currently comprises approximately 115 students ranging in age from six to thirty-four, all of whom are drawn from the less privileged local community. Sadly however many hundreds of children have been turned away since Buskaid’s inception, owing to lack of resources. By mid 1997 it had become increasingly evident that the tiny church office in Diepkloof, which was the Project's only teaching location, was far too small to house the ever-growing number of talented youngsters eager to join Buskaid. No two teachers could work simultaneously unless one was prepared to teach outside - an arrangement wholly dependent on favourable weather conditions! A lengthy search for new premises finally led to the procuring of a suitable site in Diepkloof for a purpose-built music school. The funding for this unique project was provided by a number of South African trusts and companies. The Buskaid Music School, which consists of seven studios, a music library and a large rehearsal room, was opened in early 1999 and is a thriving hub of activity in the community. Now, however with the huge increase in student and teacher numbers, the school, which was built to house just two teachers and 35 children, is simply not big enough to accommodate the current register of 115 students and twelve teachers. Detailed plans have been drawn up by a local architect, and the Buskaid Trust is urgently seeking to raise R5 million to double the size of the school and convert a neighbouring house which it owns into an instrument repair workshop. In 1998 the young musicians recorded their first CD, an album of Christmas Carols. Buskaid's second CD Soweto Dance was released in South Africa in 2000. In the course of its 2002 tour to Europe, the Buskaid Ensemble recorded a third CD of its own township kwela arrangements, Tshwaranang ('Unity'), at the Snape Maltings in Suffolk. Tshwaranang was released in South Africa in July 2003 and has been warmly received worldwide. A further CD, Buskaid Live!, a double album compilation of live international performances is also very popular with Buskaid supporters; whilst Buskaid's fifth CD Crazy (of popular 80s hits), which was recorded between 2004 and 2008, was released in 2009. Buskaid's latest recording, of entirely new Kwela and Gospel arrangements, was recorded in 2015 and will be released when the necessary funding to complete this project has been raised. Soweto Strings, Mark Kidel’s award-winning documentary about Buskaid which has been shown world-wide, also features Buskaid’s 2007 Paris concert. In 1999, Rosemary Nalden won the Shoprite Checkers SABC3 'Woman of the Year' Arts and Culture Award, whilst later that year Buskaid won the Arts and Culture Trust (ACT) Award for best Cultural Development Project. In 2002 Rosemary Nalden was awarded an MBE in the Queen's Birthday Honours List, and in 2003, the University of Auckland's Distinguished Alumni Award. In 2003 the Project was named joint winner of the Most Successful ACT-funded Project. In 2006 Rosemary was Highly Commended in the category of Community Builder for the UK's prestigious Beacon Fellowship Awards. In October 2007 Buskaid won the ACT Arts Education Project Award. In 2009 the Buskaid Ensemble was listed by Gramophone Magazine as one of the world’s ten most inspiring orchestras, alongside the Berlin Philharmonic Orchestra, the London Symphony Orchestra, the New York Philharmonic, the East West Divan Orchestra and the Simón Bolivar Youth Orchestra. In 2013 Rosemary Nalden was awarded Honorary Membership of the Royal Philharmonic Society, a rare and highly prestigious Award which has been granted to fewer than 140 musicians in the past 200 years. In 2015 Buskaid was chosen to receive the 2015 Art Award from the Turquoise Harmony Institute. Since 2002, the South African and UK Buskaid Trusts have assisted six outstandingly gifted students to study at prestigious UK Music Colleges. Samson Diamond (violin), Gilbert Tsoke (cello) and Kabelo Motlhomi (violin) all studied at the Royal Northern College of Music in Manchester; more recently Kabelo Monnathebe (violin) and Tiisetso Mashishi (viola) were awarded full fee scholarships by the Royal Academy of Music London, based on their successful auditions; they were joined at the RAM in 2011 by Simiso Radebe (violin). Both Kabelo and Tiisteso graduated with BMus degrees and have now returned to South Africa. Samson Diamond graduated from the RNCM with First Class Honours and stayed for a further year to complete his Masters degree. On returning to South Africa, he won the Standard Bank Young Artists Award for Music in 2010. Samson Diamond now leads the Odeion String Quartet, University of Bloemfontein, Free State. Gilbert Tsoke chose to pursue a different career path, but still plays regularly with the Buskaid Ensemble. Kabelo Monnathebe and Tiisetso Mashishi are both pursuing successful freelance careers as teachers and performers in Johannesburg. In 2002 Buskaid launched two innovative programmes. The first was a teacher-training programme for a group of senior Buskaid students, who, alongside Rosemary Nalden and Sonja Bass, now comprise Buskaid’s entire string teaching staff, apart from one part-time teacher of form, analysis and aural. There are currently eight Assistant teachers and large numbers of aspiring young trainee teachers working and helping at the Music School. The second, an 'in-house' instrument repair project, is run by Sonja Bass, who has received specialised training. In October 2002, Sonja spent a month at the Newark School of Violin Making and in the workshops of J&A Beare, the highly reputed British violin repairers, working alongside top UK instrument restorers. Sonja is now solely responsible for the maintenance of Buskaid's considerable collection of stringed instruments and bows. In the nineteen years of its existence, the Buskaid Music School has produced a string ensemble with a formidable reputation for high standards of performance and a sophisticated grasp of musical style. As a result, it has become widely sought-after for a variety of functions and events, many of which are of an extremely prestigious nature. These include appearances with a number of international artists such as Sir John Eliot Gardiner, Steven Isserlis, Bernarda Fink, Melvyn Tan and Sir Karl Jenkins; several performances in the presence of former President Nelson Mandela and President Thabo Mbeki, as well as Her Majesty Queen Elizabeth II, The Duke of Edinburgh, HRH Prince Charles, the Prince of Wales, HRH The Duke of York, HRH the Earl of Wessex and the First Lady of the United States of America, Mrs Michelle Obama. To date the young musicians have, through such events, generated several million Rands for the Buskaid Trust. Although there have been many remarkable events in Buskaid's short history, perhaps the most extraordinary of these was Sir John Eliot Gardiner's visit to South Africa in February 1997 to celebrate the opening of the new Project. Sir John Eliot spent a week in Soweto with twelve members of the English Baroque Soloists, working voluntarily with the young Diepkloof students. The culmination of this week of intensive musical activity was a concert in which each Buskaid student played alongside one British musician with whom he or she had studied for the entire week. This unique event not only raised awareness of Buskaid's activities, but also highlighted the great potential that music has to unite communities of widely differing culture, education and environment. Since then Sir John Eliot Gardiner has conducted the Ensemble on five occasions: in London (1999, 2002 and 2014), Paris (2007), and at a Promenade Concert at the Royal Albert Hall, London in July 2007. Over the past fifteen years the Ensemble has toured internationally some twenty four times, performing with huge success in the UK, France, the USA, Ireland, Holland, Germany, New Zealand, Botswana, Syria, and Colombia; in London for TEDx Observer, followed by Paris and Toulouse (2012); as guest artists at the City of London, Cheltenham and New Haven international festivals; at the Cité de la Musique and Salle Gaveau, Paris; at the 2007 BBC Promenade Concerts; and more recently in the UK in 2014 when they appeared for the first time at the South Bank, Queen Elizabeth Hall, at the Cheltenham Town Hall for their third appearance as part of the Cheltenham Festival, at St George's Bristol and at Boughton House, Northamptonshire. In February 2007 the Ensemble travelled to Paris with four members of Dance for All (DfA) to take part in Sir John Eliot Gardiner's "domaine privé" at the Cité de la Musique, featuring the music of Jean-Philippe Rameau. Buskaid and DfA achieved high acclaim for their interpretation of a suite of Rameau dances with African choreography, as part of a concert/workshop conducted by Sir John Eliot Gardiner with the English Baroque Soloists. 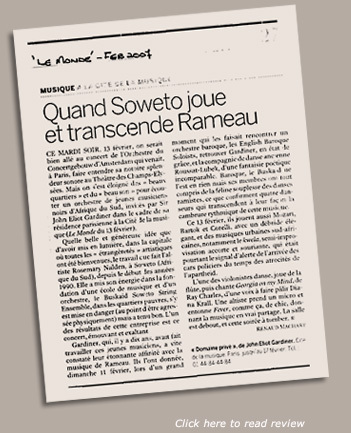 Two days later, the Ensemble, conducted by Rosemary Nalden, presented its own classical programme at the Cité, for which it received standing ovations and a rave review in Le Monde. The Ensemble performed to great acclaim at the BBC Proms in July 2007, appearing at the Royal Albert Hall in a programme similar to the Paris Rameau project, presented by Sir John Eliot Gardiner. The Ensemble performed its own sequence of Rameau dances with the dancers from Dance for All in the arena of the hall, under the direction of Rosemary Nalden, before joining the English Baroque Soloists and Sir John Eliot Gardiner on the main stage for the remainder of the concert. This concert was broadcast on live TV and radio by the BBC throughout the UK to an audience of hundreds of thousands. The Ensemble has had two major works composed for them: Soweto Suite for Strings by Karl Jenkins is dedicated to the Buskaid musicians and Rosemary Nalden; and Sancho's Dance Mix especially composed for Buskaid by Julian Grant and given its premiere at Boughton House in the presence of the composer in July 2014. Is the Buskaid Music School an ordinary day school where children study all subjects? No, all the students go to different schools or colleges during the day, and then come to Buskaid after school and over the weekend. Most of them go to local schools in Soweto, but a few travel to Johannesburg to attend better equipped schools. Over the years Buskaid has paid the fees of eleven gifted students from disadvantaged backgrounds to enable them to attend one of these schools. Most of the tuition which Buskaid students receive after school is individual - a private lesson with Rosemary, Sonja, Lesego, Keabetswe, Cecelia, Thokozani, Kabelo, Tiisetso , Katlego, Nathi and Phumelelo. During the weekends, Rosemary and the assistant teachers take groups on Saturday mornings – early beginner violins, and junior violins and violas. On Saturday afternoons Rosemary rehearses the Buskaid Ensemble for four hours. On Sundays the beginners, juniors and intermediate ensembles rehearse in separate groups, taken by Sonja, Keabetswe, and Phumelelo. From time to time, these junior rehearsals take place with the assistant teachers in charge. Membership of Buskaid is a very big commitment: all students are expected to attend all classes and lessons punctually, and of course to practise daily! Does Buskaid teach street kids? No, street children have never come to Buskaid. Most street kids tend to live in Johannesburg, and Buskaid serves the local township community in Diepkloof. However, the majority of Buskaid’s students come from difficult and impoverished backgrounds where often parents are unemployed, absent or deceased. Quite a few live in shacks or overcrowded rooms in backyards. How does Buskaid select its students? Most people think that Buskaid selects children on the basis of their musical talent, because so many of its students are so talented. However this is not the case. Children who live within walking distance of the Music School and whose parents are unemployed, or are in impoverished circumstances, are given priority. However the selection process tends to be quite random: Buskaid receives dozens of requests from local children and many are turned away for lack of resources. Sometimes however a child may come and sit in on classes for several weeks, hoping for a place. This persistence is nearly always rewarded, for the child is judged to be very keen and motivated and will eventually be accommodated. Does Buskaid teach only stringed instruments? Buskaid’s main commitment is to offer its students string tuition of the highest quality. However, one student, Phumelelo Ndlovu, has successfully passed Grade 8 on the piano and is now giving piano lessons to some of the junior string pupils. Sonja Bass, Buskaid’s cello and bass teacher also makes time in her very busy schedule to take several theory classes. Susan van der Wat visits Buskaid twice a week to give aural classes and lessons on musical form and analysis to older students studying for Diploma examinations. From time to time Jill Richards, Buskaid’s pianist Trustee, comes down to the Music School to work with the more advanced students, often on their exam repertoire. Does Buskaid close during the holidays? Unlike many other music projects, Buskaid remains firmly open during school holidays (apart from the Christmas period), since it recognises that this is a time when many township youngsters are at a loss to fill their days. Almost every Easter vacation, the Buskaid students are taken to a beautiful bush venue for intensive tuition and some outdoor bush experiences. Buskaid does however respect the wishes of its students during school exam times and encourages them to spend less time at the Music School and more time studying during these periods. The majority of the instruments have been donated to the Buskaid Trust - in particular, the violins. Over the years the charity has benefited from gifts of some beautiful instruments - from South Africa, the UK, Ireland, Germany, Holland, the USA, New Zealand. However, many of the bigger instruments - violas, cellos and double basses have been bought by the Trust, often with specific donations, notably from the National Lottery Distribution Trust Fund. Are the students allowed to take them home and do they own them? Students start taking their instruments home after the first three months of tuition, when it is felt that they can begin to practise on their own. In the ten years of Buskaid’s existence there have been remarkably few accidents, as students are constantly reminded of the importance of caring for their instruments. They do not own their instruments but are lent them for as long as they remain Buskaid members. What happens to the older students – do they graduate from Buskaid? Buskaid is now nineteen years old and even nineteen years is not a long time in the life of a serious string player, so this is a difficult question to answer as it is “work in progress”! It is hoped that eventually a number of Buskaid graduates will form their own professional orchestra. But this process will take time, as learning a stringed instrument is such a long-term commitment. There are already many talented youngsters in Buskaid who want to make music their chosen career and Buskaid is firmly committed to helping them fulfil their dream! Effectively Buskaid's commitment to forming its own professional orchestra is now a reality, since the majority of Buskaid Ensemble members are now paid for 'gigs' and concerts. Why support Buskaid, a classical music project, when there are so many other more pressing needs in South Africa such as the alleviation of poverty and the HIV/AIDS pandemic? The Buskaid Trustees, staff and students are all very aware of the many challenges still facing the majority of South Africans. As the Music School, which stands in the grounds of a church, is situated right in the midst of the township community, the difficulties of daily life are all too evident. Buskaid aims to address these problems through education and music. Firstly, because they have received training in these skills, Buskaid’s senior students are now earning fees for teaching and performing. Many of them use this money to pay for their tertiary education and, frequently, to supplement the entire family income. Buskaid believes passionately in empowering its students to take responsibility for their lives rather than depending on others for assistance. Secondly, Buskaid by no means avoids the HIV/AIDS issue and the scourge of drug abuse which threatens the lives of many township youngsters. These issues are dealt with on a regular basis, at workshops and at the Music School, whilst counselling, AIDS and drug tests are offered when appropriate. Buskaid is very proud of the fact that in its nineteen years of existence, there have been only two known instances of HIV (both in students who had already left the project), which is negligible in terms of the national statistic. But the most important reason for the existence of a project such as Buskaid lies in its power to transform not only individual lives, but the entire community. South Africa is a country rich in creativity and untapped talent. It has been proven many times that music has a deep and lasting impact on children’s general educational development, as well as developing teambuilding and encouraging the achieving of excellence. Many people comment on the fact that Buskaid students are more positive, more motivated, more disciplined and generally more committed to improving their lives and those of their community. By affecting the lives of each one of its students, Buskaid has a profound influence and inspirational impact on civil society in South Africa. Where does the money come from to fund Buskaid? Over the years Buskaid has been very generously sustained by a number of South African businesses and trusts. Its largest current sponsor donor is Redefine Properties. Other significant funding has come from the USA and from the UK, where Buskaid has sister trust organisations. A further source of funding is derived from fees raised by the Ensemble when it performs at corporate functions - in other words, self-generated revenue. Similarly, money raised from CD sales goes straight back into the Trust. long-term sustainability lies in building its Endowment Fund, which at the moment is very modest. Once this is achieved, more energy, time and resources can be devoted to vital teaching, teacher-training and expanding the reach of the Music School.